Phonak are the latest hearing aid brand to introduce a remote fine-tuning feature to their hearing aids. 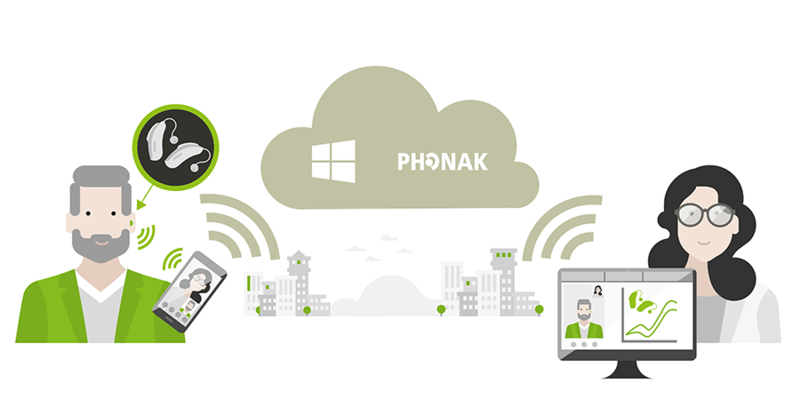 Phonak have partnered with Microsoft to bring this new service to fruition. Phonak’s new Remote Support Service enables the remote fine-tuning of its Audéo Marvel Bluetooth hearing aids from virtually anywhere in the world. The feature which is available through the new Phonak app allows hearing aid wearers to communicate with hearing care professionals by smartphone audio and video. It also will enable professionals to adjust their hearing aids in real time anywhere (except maybe the toilet, some things need to be sacred). The new myPhonak smartphone app is used to enable the system. It utilizes Microsoft’s Azure cloud-based technology platform to manage audio, video and digital communications. The Azure platform is pretty robust and it offers the stability needed for the numerous data exchanges going on. The system is pretty cool, it offers video calling which enables the user and their hearing care professional to see and hear each other while the hearing care professional makes simultaneous real-time updates to the hearing aid programs. Full fine-tuning capabilities. The audiologist can make nearly all the same changes remotely as in the clinic. Real-time adjustments. The audiologist makes the tweak and the patient instantly hears the difference—enabling efficient fine-tuning in a variety of listening settings. Video chat. Face-to-face interaction between professional and patient results in much better communication. At the same time, the audiologist controls the hearing aid adjustments from the desktop computer. Phonak have been trialling this type of system with the VA (the U.S. Veteran’s Administration) which is one of the world’s largest providers of hearing aids. Now they have introduced the system to their private hearing aids offering. We are in the middle of a remote care revolution right now with all of the major hearing aid brands moving toward offering the system. Signia was the first and they were quickly followed by Resound, we believe that the rest will follow. That is a good question, just because these systems are in place doesn't mean every professional will provide the service. I think it will be a personal decision for providers on how and if, they provide remote care. There also may be financial concerns to be considered. Remote care is very new and there doesn't seem to be any general consensus within the profession about whether it should be included as standard or whether it should be charged for as an extra. As with many things, I think the shape of remote care in the future will be based on your demands. Market demands will shape how remote care is offered and whether it is an industry-wide phenomenon. The hearing aid brands are certainly betting on it being the future and my own expectations are that it will become commonplace. The Signia system is a lot like Phonak’s Remote Support Service but has less real-time adjustment capability. Resound's system is a different type of system with no real-time communication or fine-tuning. With the Resound system, the professional makes the changes and then pushes out those changes to you. They appear in your app and you apply them. Phonak Remote Support will be available with the rollout of Audéo Marvel hearing aids at the end of November 2018 in Australia, Canada, France, Germany, Switzerland, United Kingdom and the USA.